Tottenham boss Mauricio Pochettino says Jadon Sancho's impressive Borussia Dortmund displays have not come as a shock to him. But Pochettino was tight-lipped when asked whether Spurs had been among the clubs who tried to sign Sancho from Manchester City. 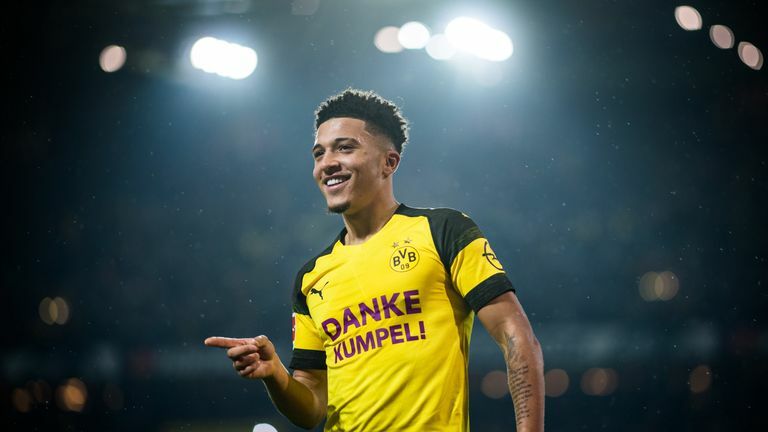 Sancho is having a superb campaign, having helped Dortmund to the top of the Bundesliga and earned his first England caps. The 18-year-old will now come up against Pochettino's Tottenham side in a Champions League last-16 tie, which gets underway at Wembley on Wednesday night. Asked about the huge impact Sancho has made, Pochettino said: "He doesn't surprise me. "We knew very well that he was capable of doing what he's doing now, with game time. "The quality he was showing at Manchester City and with his national team (at age group level) - we were talking in the last few years, that he was a massive prospect to be a very good player. "He is showing now in Germany that he can cope with the pressure of playing in the Bundesliga and Champions League. "And it doesn't surprise me, his talent is there." Sancho told Four Four Two Magazine earlier this year that Spurs were among the clubs interested in him when moved to Munich - but a smiling Pochettino said: "I'm not talking about that", when asked about the claims. Dortmund are five points clear at the top of the Bundesliga, and Pochettino accepts that his team face a huge challenge in the coming weeks - but has backed them to progress. He said: "I really believe that we can win every single game. We know very well that the competition is going to be tough. "We are going to face a team who are at the top of the table and who are doing well. "It's a very competitive team and of course it is going to be tough. All the respect to the opponent - but I am a person who will always believe we can beat any team."